Time keeping is derived from the AC mains line frequency (50/60Hz selectable) which is divided down using a divide by 10 and a divide by 5 or 6 counters to obtain a 1Hz signal to count seconds. From there the seconds and minutes each contain divide by 10 and divide by 6 counters and lastly the hours uses a presetable divide by 10 and 3 or 4 resetable counter for 12 or 24 Hr selectable operation. The counters are comprised of flip-flops (F-F's) configured in a series or "ripple" configuration generating a binary count displayable by turning on the "BINARY DISPLAY" LED's. 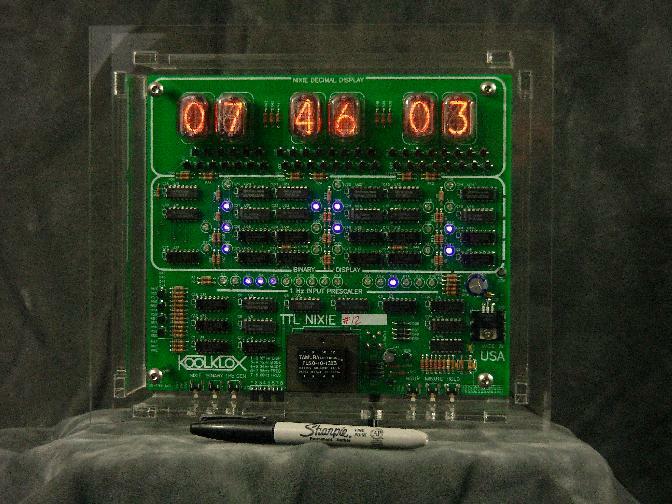 The binary count is then converted to decimal using a handful of basic NAND and NOT logic gates and displayed by turning on the NIXIE tubes. Power is supplied by a standard 9VAC/1A wall transformer (wall-wart), full wave rectified, filtered and linear regulated to 5VDC used for powering all the IC's. The high voltage required by the NIXIE tubes is derived from a dual primary 10v transformer hooked up "backwards" with its primary winding in series to produce approx 200-250 volts, rectified and filtered. Display dimming is performed using a total of six F-F's (two F-F's per counter) to make three 2-bit counters offering four levels of brightness. The two bits are combined resistively creating a stepped analog signal fed to a common collector voltage source for the two LED displays, the last counter is fed to a pulse width modulator (PWM) to drive the NIXIE tubes. Utilizing PWM topology permits the NIXIE tubes to dim while maintaing even lighting of their segments.